Government funding from Emergency Preparedness Canada the fife department then purchased and completely overhauled a used I ton rescue vehicle during the summer of 1995. The complete rescue package accounted for more than $45,000 worth of valuable equipment, which has been utilized on many occasions since the project was completed. Another part of the past was demolished when the fire department moved to a new fire hall at 61 Railway Ave. North. The old fife hall on Centre Ave. South was temporar­ ily used for a recycling depot and later demolished. 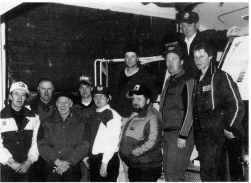 The new 3 bay fire hall became home in the spring of 1994 and holds the pumper, tanker and rescue vehicle and includes a classroom, washroom, shower facility and upstairs stor­ age. The 1964 pumper, which became a tanker, was fondly known as Old Red and was sold to a Brandon area farmer in 1997. A 1980 Chev tanker was purchased from Onanole Fire Department in 1997. Old Red could not pass new government safety inspections without major mechanical work. According to the new owner, Old Red will haul water to his animals on the farm. October 1985 a mobile phone and radio was installed in the pumper. The ability was there to call a mobile tele­ phone operator and communicate directly with any telephone or with neighboring fire departments with the radio. During this time council, along with the federal and provincial governments, established emergency disaster plans for the community. Funding during the project provided for a base radio and 3 portable radios. The early 1990's saw the fire department move from the central town siren to pagers for their emergency dispatch by Erickson Hospital staff who answered the emergency fire phone. The town siren was also maintained as back up to the paging system. In 1993, the Manitoba Association of Fire Chiefs began lobbying for province wide Emergency 9-1-I-phone service. On April 23, 1998 the seven-digit fire phone number was replaced with the universally accepted 9-1-I-phone number. Although professionally trained operators now dispatch fire, ambulance and police emergencies, the fire department cannot forget the dedi­ cated and professional manner in which hospital staff handled emergency calls over the last several decades. Along with new technology comes the need for train­ ing. Firefighters participate in several programs accredited by the' International Fire Service Accreditation Congress'. Among the many programs are, Level I Fire Fighting, Hazardous Materials Awareness, Vehicle Extrication, First Aid and CPR. Fire department members certified as instruc­ tors, through the Manitoba Emergency Services College and Red Cross in Brandon, facilitate the training. Erickson Fire Dept. (December 1997) Assistance was required to remove the driver of this semi following a collision with a mini van. During the flood of the century, the spring of 1997, the Red River spilled over her banks. Southern parts of Manitoba were covered by water. To assist with the flood relief effort the fire hall was opened as a central drop off for area residents wishing to donate to flood victims. More than 2000 kilograms of food, clothing, bedding, toiletries and toys were collected and shipped to Winnipeg for distri­ bution. With the tum of the Century, the fire department capped a complete upgrading with modernization ofvehi­ cles, equipment and fire hall. Erickson and Clanwilliam councils shared our vision that major improvements were required. Fire department members alone raised $48,000 through government lobbying, raffles, rental of our dunk tank and donations to bring a wide range of specialized rescue, fire fighting, communications and training tools.